There's an old story about placing rocks, pebbles and sand in a jar. 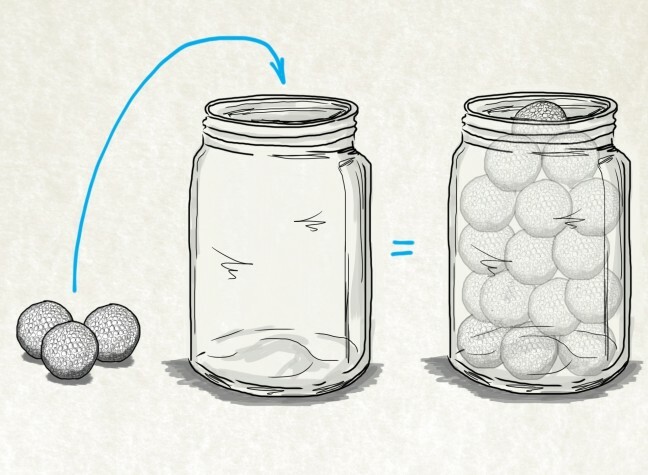 If you place the sand and pebbles into the jar first, the rocks won't fit. But if you put the rocks in first, pour the pebbles and sand in afterward, everything will fit. Consider the sand, pebbles and rocks as the activities you undertake in your jar – your sales process. While it needs to fit in every activity – from finding prospects to making calls to writing proposals and amending contracts – you can only succeed if you focus on key activities, and fit the pebbles and sand in afterward. What are your key sales activities? Key sales activity – an action under your direct control that has the highest possible positive effect to achieving your sales goal. A key sales action will set other preparatory and consequent actions in motion, taking you closer to your sales goal. Those three make up your key sales activities. Your ability to constantly deliver a certain number of these actions determines how many dollars or euros you put in your pocket. Wouldn't you need to do more than just three things? Of course, to close a sale you'll need to do more than a constant repeat of just these three actions. There are no unimportant details for a true professional in any field – every little thing matters, adds to the end result, and cannot be overlooked. The issue here is that you can't focus on all things. By focusing on a small number of key activities you gradually become a master of many. To drive forward in sales, your mind needs to be clear instead of being all over the place – and that's why people learn to focus. If you wanted to end a year with a personal sales revenue of $1M, and your average sale is around $20,000, you would need close an average of 5 customers a month. When calculating customers per month, we use 11 months as the time period as vacation, holidays and sick leave effectively shave off a month at least. Feel free to edit this number to match your preference. If you're able to demo your product or service to about 80% of the prospects you meet (four out of five prospects agree to a demo), then your second focus is on meeting 25 prospects per month. And finally, if one out of four prospects you reach out to agrees to a meeting with you, then your third focus is on contacting 100 prospects per month. Calculating key sales action figures. Let's divide these numbers by four to get weekly key sales activities – 25 prospects called, seven initial meetings conducted, five demos delivered. These are the “big rocks” of your week around which your time as well as other sales activities, including writing proposals, sending emails and so forth, should be arranged. This is how key activities would look like in a schedule. Key actions over a week. What happens when you focus on these three activities? First, you get them done. Second, a whole lot of preparation, and following up happens. While the “rocks” remain as your focus, preparation and following up become your “bridges” as you step ahead. It's great to improve your ratios in sales, because it means you have to put in less hard work to achieve the same results. And hey, it can be done over time as you learn, become smarter and more confident. However, I haven't seen a salesperson being able to reap rewards without putting in the numbers first. So, welcome to the path of controlled success. Of course, I was looking for silver bullets in a place where there weren't any. It turned out that making 65 knocks and doing 15 sitting-down demos every single day was the only surefire way to achieving good sales numbers. Just as I was told at the beginning. In book sales, there were three key sales actions – choosing the streets to sell in (prospecting), making knocks (contacting) and demoing books. Everything else you had to do anyway – gathering information about prospects, number crunching, negotiating, writing out receipts and so forth. But there were three key sales actions that set all of these other activities in motion – three activities without which there wouldn't have been any sales.